The memorial list text begins with an important date indication: “Int iaer ons heeren duust vierhondert vichtich upten neghentiensten dach van april, zo was den eersten steen gheleyt van onser capelle. Ende daer toe waren ghecoren .VI. gouvernerers omme te vulbringhene (….) Ende alle de ghildebroeders die sichtent dier tijt ghestorven zijn die staen hier naer ghenoemt. Elc leze een pater noster, ende een ave maria, over de zielen”. The creation of the memorial list is associated here with the start of the trade chapel’s construction on 19 April 1450. As a consequence, the list was intended for religious services in the trade chapel, and it was originally started from 1450 onwards. Yet, the different hands, which can be recognised in the list, show that a first hand wrote the text up to the first three lines of p. 19, including the names Aernout Hol, painter, Ghijsbrecht de Crane, painter, and Jacop Freet, saddlebow maker. Albert Schouteet’s work shows that the painters Arnout Hol and Ghijsbrecht de Crane both died in or around 1489. So the present memorial list was copied around 1490 from an older memorial list, which was started in 1450. This older memorial list was obviously not kept up to date and it was replaced in the eighties of the 15th century. This is also shown by the fact that after registration of Hol, De Crane and Freet, a second rather similar hand registered 23 names on pp. 19-20, starting with Joos Debboud and ending with Dieric van Hecke. The latter died around 1492, according to Albert Schouteet. Yet, the 15th name concerns Willem Baert, who died between September 1486 and September 1487. Jan Coene, the 18th on the list of 23 is mentioned for the last time in other documents on 22 February 1486. Cornelis Herreboudt, mentioned twentieth, ought to have died in 1488. Perhaps the original list of 1450 simply was full in the eighties of the 15th century and it may have been temporarily completed by means of single pages. It is also possible that in these dark years, when Bruges revolted against Maximilian of Austria, the trade administration was somewhat neglected. After 1490, the register was completed on a regular basis by different hands that can be clearly distinguished more or less. Gaps seem to be absent. The last registration dates from 23 February 1801, which completed the register. The volume that was preserved does not contain any additions, end papers or covers in the back. 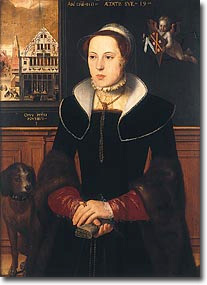 Pieter Pourbus, among other things painter of this portrait of Jacquemyne Buuck (City Museums) has been included in the memorial list with a special mention, added later on, about his year of death (1584) and his function. Jacob van Oost, the most renowned Bruges painter of the 17th century. Among other things, he painted this portrait of a Bruges family (City Museums). In the memorial list he was given just a simple mention at the time he died, in 1671. 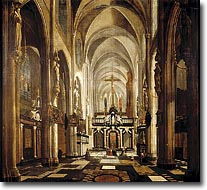 The painter Jan van Meuninxhove, who died in 1703, is particularly known here as a painter of townscapes and church interiors, like this interior of the vanished Church of St Donatian (City Museums). He is one of the last artists mentioned in the memorial list. After the foundation of the Bruges Academy in 1717, Bruges artist painters were no longer expected to be member of the trade.